The CD274 antigen is known as Programmed Cell Death 1 ligand 1 (PDCD1LG1 or PD-L1) or B7-H1. It is encoded by a gene located on the human chromosome 9p24. Immune cell function implicates important modulators known as cosignaling receptors. On T cells, the cosignaling receptors belong to either the immunoglobulin (CD28-like) or TNF receptor (TNFR) superfamilies. The CD28 immunoglobulin-superfamily is composed of coinhibitory (CD28, ICOS) and costimulatory receptors. Programmed Death- 1 (PD-1) is one of the three coinhibitory receptors with Cytotoxic T Lymphocyte Antigen 4 (CTLA4) and CD272. 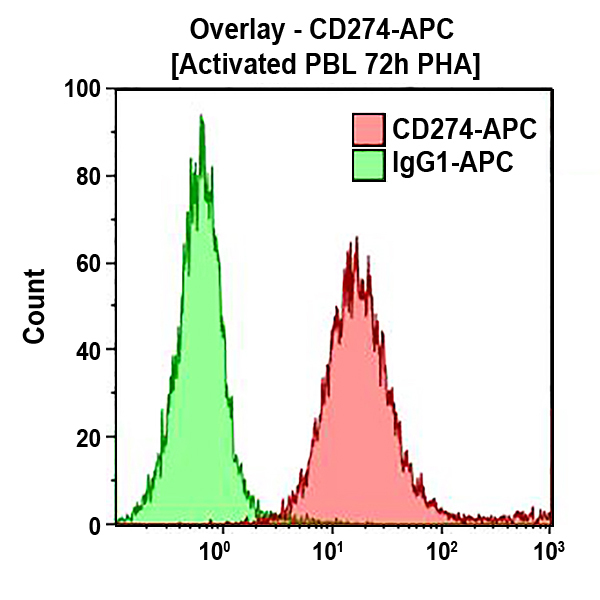 CD274 antigen is one of the two ligands, with PD-1 ligand 2 (PD-L2), for PD-1 and belongs to the B7 family. The PD-1 - PD-L1 interaction plays a critical role in regulating T cell activation and tolerance. In particular, it plays a role during development by inhibiting the TCR-mediated positive selection of thymocytes. It has also been shown to be implicated in the regulation of CD4 positive T cells proliferation. CD274 antigen is expressed on immature dendritic cells (iDC), mature dendritic cells (mDC), IFN-γ-treated monocytes, and follicular dendritic cells. Clone Description The PD-L1 monoclonal antibody recognizes dendritic cells, T cells and follicular dendritic cells. It has been assigned to the CD274 cluster of differentiation during the 8th HLDA Workshop on Human Leukocyte Differentiation Antigens, held in Adelaide, Australia, in 2004.